Due to manufacturer's restrictions we are unable to ship Puma products to Great Britain. Rock that relaxed, athleisure look in the sleek and stylish Feel It Pullover Hoodie. Featuring dryCELL technology, flatlock seams for reduced friction and a trendy, street-ready fit, you'll look cool and stay comfortable both in and out of the gym. 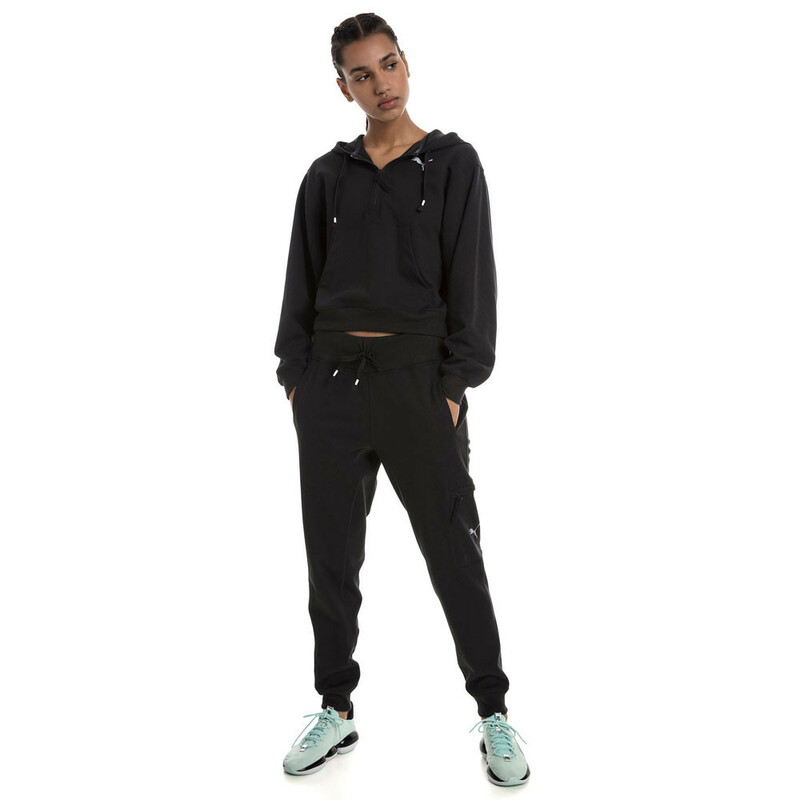 The Feel It Women's Pullover Hoodie is constructed from dryCELL technology that works incredibly hard to wick sweat as it's produced. Once wicked the technology transfers the sweat to the outer layers of the fabric where it can be easily evaporated, ensuring you stay cool, dry and comfortable. In addition, Puma has used flatlock stitching throughout that dramatically reduced the chances of chafing and skin irritation, keeping you feeling comfortable at all times, while a loose, relaxed fit offers superior comfort and ease of movement. This construction allows you to move and stretch freely without encountering any restrictions. Furthermore, a breathable French terry fabric is used within the construction provides exceptional next to skin comfort, while a half zip construction allows easy layering as well as offers strategic ventilation for when you need it most. An attached hood provides additional coverage when needed while lastly, a kangaroo pocket offers convenient storage space for essential items. PUMA SE, branded as PUMA, is a German multinational company that designs and manufactures athletic and casual footwear, apparel and accessories, headquartered in Herzogenaurach, Germany. The company was founded in 1948 by Rudolf Dassler. In 1924, Rudolf and his brother Adolf Dassler had jointly formed the company Gebrüder Dassler Schuhfabrik. The relationship between the two brothers deteriorated until the two agreed to split in 1948, forming two separate entities, Adidas and PUMA. Both companies are currently based in Herzogenaurach, Germany. Following the split from his brother, Rudolf Dassler originally registered the new-established company as Ruda, but later changed the name to PUMA. PUMA's earliest logo consisted of a square and beast jumping through a D, which was registered, along with the company's name, in 1948. PUMA's shoe and clothing designs feature the PUMA logo and the distinctive "Formstrip" which was introduced in 1958. DryCELL Technology - Wicks sweat and dries incredibly fast. Flatlock Stitching - Eliminates the chances of chafing and skin irritation. Loose, Relaxed Fit - Offers comfort and ease of movement. Half-Zip Construction - Allows easy layering as well as provides added ventilation. Breathable French Terry Fabric - Provide exceptional next to skin comfort. Attached Hood - Offers additional coverage. Kangaroo Pocket - Provides a convenient storage space for small essential items.